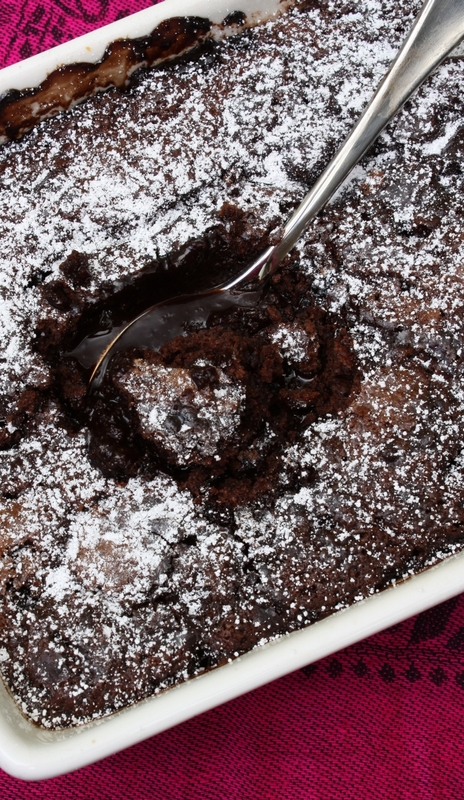 Chocolate self-saucing pudding is the ultimate winter comfort food – fudgy and rich and warming. There are lots of recipes available for this pudding, as it is an Australian staple. My recipe however, has a little more cocoa than the standard ones, because I love the chocolate to predominate. Try to get some dutch process cocoa; it’s really superior in taste. The pudding is best served piping hot with cream or vanilla ice cream, and is a perfect finale to a family dinner. At our place I like to make it when we are having a roast dinner and put it into the oven just as we sit down to eat our lamb. Then it’s ready just at the right time for dessert. Heat oven to 170 C. Grease the base and sides of a 6 cup capacity pudding dish, either rectangular or oval, with the extra butter. In a medium-sized bowl combine the flour, caster sugar and 3 tablespoons of cocoa. In a jug whisk together the milk, melted butter, egg and vanilla with a pinch of salt. Don’t miss out the salt – it enhances the flavour of chocolate immeasurably. Pour the milk mixture into the dry ingerdients in the medium-sized bowl and beat togathr with a wooden spoon until well combined. Spread the poudding mixture into the dish. In another small bowl mix together the brown sugar and remaining cocoa, and then sprinkle over the top of the pudding mixture. Pour over the boiling water, drizzling onto the back of a spoon, first, so as to cover the pudding evenly. Bake for 30 minutes, or until the pudding is cooked. The sauce will sink and the pudding rise to the top (a wondrous experience for children). Dust with icing sugar and serve hot, with cream or ice cream. I meant to say ‘more cakey’ silly predictive text! Gorgeous pud and no tweaking with recipe at all. Made many times as it’s a fav in our house. Even made it for Christmas Dinner for those who didn’t want Christmas pudding. Is it safe to assume that the pudding mixture you are referring to is the dry ingredients from the mixing bowl and the wet ingredients from the jug mixed together? 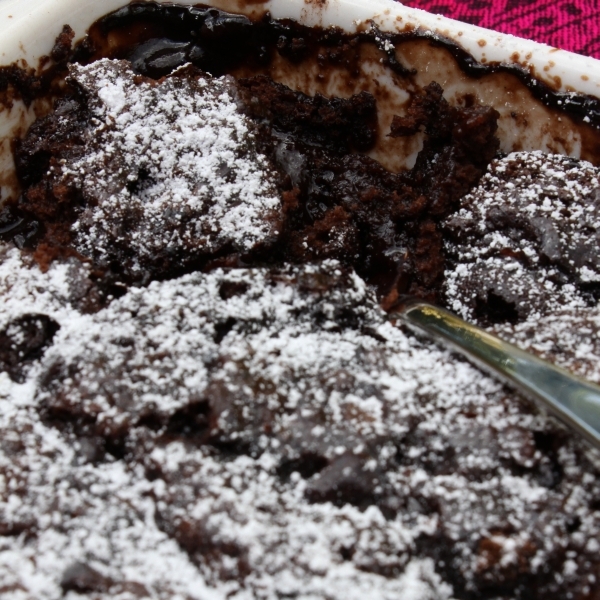 Thanks Emma – it is pretty scrummy, and in your part of the world you are coming into the season where a good serve of chocolate pudding will be just the thing to warm you an an autumn evening. I am going to be planting spring vegetables today and loving the fact that the weather is warming up. Have a great day on the other side of the world. margaret.